Need a better idea of what we do? Rope Partner’s unique work has earned us significant TV and media coverage over the years from PBS documentaries to articles in the New York Times. 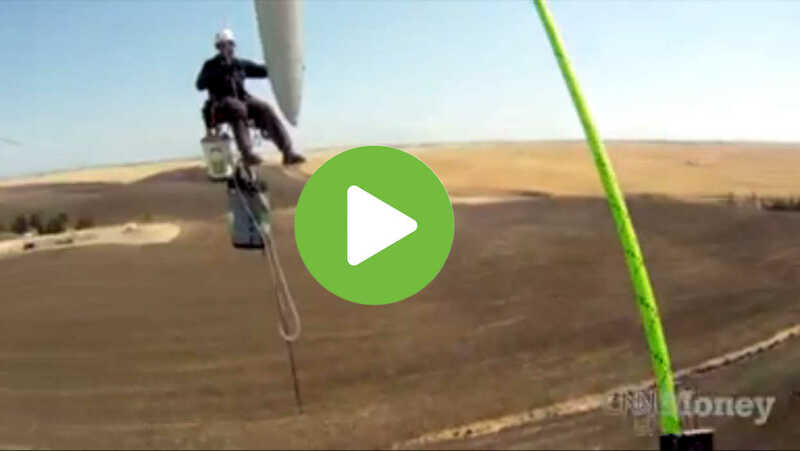 Watch our rope access videos, read our releases or visit our photo gallery! AWEA WindPower 2018 Chicago, IL - May 7th - 10th! WindPower 2017 – Anaheim, May 22-25! Read "Chris Bley - Greatest Person of the Day"
Read "Not Afraid of Heights? Into Renewable Power? Here's the Job For You!" Read "Giving Old Blades New Lift"
Read "Wind Power Creates Unique Job Opportunity for Rock Climbers"
Read "Companies Recruit Rock Climbing Enthusiasts to Repair Wind Turbines"